For the third year in a row, John's NoFrills in Shelburne has collected money to donate to the Shepherd's Cupboard, Shelburne's local Food Bank. Teunenbroek is no stranger to local charities also participating in both the Fire Fighters and local Police Services Christmas Drives, often helping the Lions Clubs and many, many others. On June 29th, van Teunenbroek presented $1098.89 to the present Chair of the Shepherd's Cupboard, Reverend Stephanie Pellow. When asked if for some reason John's No Frill's couldn't contribute, Pellow commented," We would feel the impact. Oh, yes, we are very grateful." van Teunenbroek explains, "As we are in the food service industry, it makes sense that we identify with those in need of food. Even the President's Choice fundraisers we are involved with, we see the results leading right back into the local communities. We appreciate the community support. " And How did John's No Frills raise this amount of money for the Shepherd's Cupboard? In a collaborative effort, John's No Frills cashiers asked Shelburnites if they would like to donate while going through their till. That simple but integral contribution will be the reason many can eat. Congratulations to John's No Frill's Staff, and the community for helping to support our own. Just another fine example of the "Stuff" Shelburnites are made of- the Good Stuff! The Shepherd Cupboard's Hours are Wednesday 11 a.m- 1p.m, Thurday 6 p.m.-8 p.m. and is located at Entrance C at the Mel Lloyd Centre. To reach, Reverend Stephanie Pellow. call St. Paul's Church at 519-925-2251. Horning's Mills Celebrated A Grand Opening Ceremony for their new playground and baseball diamond on a very wet Sunday, June 28, 2015. So pleased with the playground and so happy for the community, nothing could dampen the Horning's Mills' Community Spirit as celebration festivities simply moved indoors at their Community Centre. In attendance, Melancthon Mayor, Darren White, shared a few words in gratitude for the hardworking community he represents, acknowledging all the volunteers who worked tirelessly to make this park a reality. a five thousand dollar check during the opening ceremony. So many came together to make this playground and baseball diamond a reality as seen below. (LtoR) Councillor for the Town of Melancthon,James Webster Deputy Mayor of Melancthon, Janice Elliott, Hydro One's Customer Operations Manager, Steve Davey, Horning's Mills Park Board members, Nanci Malek,(also Dufferin County Museum and Archives Marketing and Promotions Co-ordinator) Christophe and Rita Kirch. Week Seven at the Shelburne BIA Farmer's Market! Perfect for Patio's! Old Country Farm bring Lettuce and edible flowers in window baskets. They are perfect for Condo living and a convenient way to eat fresh. New assortment of preserves of all sorts and fresh baking arrived this week as well. As their business card states, "Simple,Fresh, All Natural"
Meet Joey Lemieux. Most Shelburnites recognize this man as owner of Soaring Hearts Health Foods on Main St. but now, we will have to also know him as the face behind Escarpement Foods. Lemieux has created this product from conception, to the natural packaging that embraces his very own, homegrown, organic blend of naturally delicious teas. To find out more about these teas, visit the market and try a sample or stop in at Soaring Hearts to pick up a box. They are light, refreshing, and offer a feel good feeling knowing the tea is such a high quality organic product. Even the tea bags are special. How special? You'll be surprised. Have a visit to find out more! Photo Gallery June 2015 for more photographic coverage. treats Shelburne BIA Farmers Market goers with a second visit. Glenbrook Elementary Celebrating Milestone in Ground Breaking Ceremony having reached their financial goal to begin installing their own Natural Playground. Find out more: Go to 'more' in the option bar and choose Shelburne School News. Very Sad &Frightening News Folks! Be Careful Out There Shelburnites! Go to "more" in the option bar and choose Editorials. Go to Photo Gallery June 2015 for more photographs! & How Much It Could Cost You If You Are Too Loud! Find out the best way to keep your bicycles and skateboards safe! Chair of the Town Of Shelburne's Heritage Committtee, Laurita Townsend, brings a special message to Shelburnites regarding the lane way appropriately named Jelly Lane after the Town of Shelburne's Founding Father, William Jelly. Did you get the answer? Opposite the 30 Sideroad &1st Line EHS sign post there was once a church attended by a small congregation of church goers. This location was once home to a church where the Seventh Day Golfites attended. The church wasn't attended very long before the sect moved on based on research. Now barely visible, the base of the stonework is all that remains. History is so important, reminding us how quickly the landscape can change and without reminders, today's society would never know what once was so very long ago. Photographic Coverage & Videos Being Added All Day. Learn what these two C.D.D.H.S (Centre Dufferin District High School) Students are doing to promote their High Schools Breakfast Program. Impressive! It's the good stuff! Auto Centre Dufferin BRING IT ON! Auto Centre Dufferin ready for Town of Shelburne Bed Race During Shelburne Heritage Day Festivities! Dufferin Oaks Long Term care Home located in Shelburne , ON is filled with wonderful volunteers who help make life run smoothly for it's residents who are so cherished within the Shelburne community. Each year, Dufferin Oaks holds a Volunteer Appreciation Dinner. (Above & featured in video)Angie Matthews, Program & Support Services Manager,County of Dufferin explains in this exclusive video. Go to www.shelburnefreelancer.com Photo Gallery June 2015 for more Photographic coverage. More Photos of Dufferin Oaks Volunteer Appreciation Dinner can be found on the Photo Gallery in June 2015 page. Stroller Boot Camp Comes to Shelburne! Certified Canfit Pro Personal Trainer, Leanne Williams is bringing her new 8 week outdoor Stroller Boot Camp to Mom's in Shelburne. Based out of Shelburne's Greenwood Park, this 8 week, program beginning June 30th runs for one hour each Tuesday at 11 a.m, and Thursday at 10 a.m.
Those wishing to take part, must register beforehand as there are only ten spaces available for this session. At only $8 each, this affordable program at only $64 includes walking warm-up, cardio, and strength training specifically for moms with babies. Williams also offers in home Personal Training and Adult Morning Boot Camps Tuesdays & Thursdays at 6 a.m., Saturday at 7 a.m. Registration is required. hits a home run with decorators! This Week At Shelburne 's Farmer's Market, The Brown's Music Time Machine And So Much MORE! Shelburne Welcomes New Vendor to the Shelburne BIA Farmer's Market! Santamaria, a family run business from Woodbridge was a real hit for shoppers who love any variety of pepperettes, sausages, cheese and so much more! Levendale Farms bringing a special offer to Shelburne BIA Farmer's Market on Thursday June 18th! Great opportunity that is completely convenient! The Granger School House today. Mrs. Grace Barr worked in the Granger School House part time for eleven years. A very important position, Barr taught her own four children and all of the neighborhood kids. Grace Barr, a very talented artist and painter in her own right, is credited with starting the Shelburne Art Group which is known today as the Dufferin Arts Council. Grace Barr's husband, local WWII Veteran, David Barr introduced me to the Granger School House and explained as only he could,"Communities were formed around the location of a school house or a church, and some buildings were used for both a school and a church." Today it's difficult to fathom walking four miles to school each day, but for some kids who lived in the country, it was just a way of life. With so much country- side between farms I asked Barr how anyone could get to know their neighbors. "Well, we all helped each other out and that's how you got to know people. Everyone knew who lived at every farm." According to Barr, life was about caring and neighborhoods could flourish simply by relying on each other. Again, different from today's society where many people can remember never knowing their neighbor in the next town house, not to mention someone who lived a mile down the road. 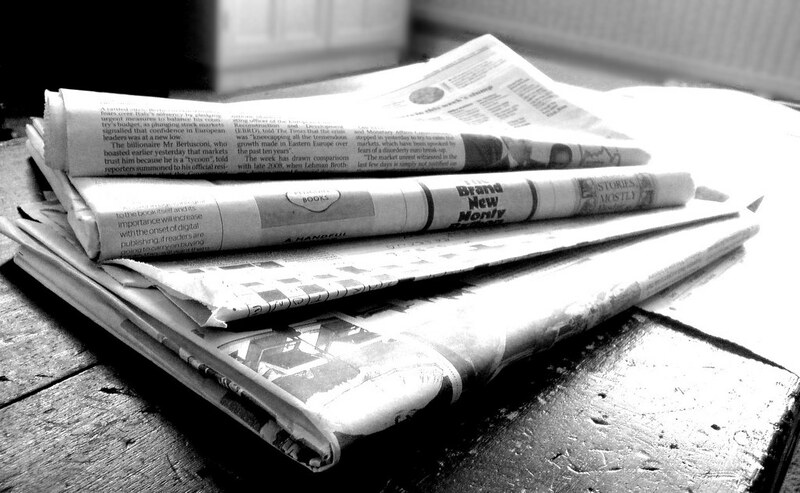 Every person has a story and that is why The Shelburne Freelancer is so important to so many, and is also where the expression came from, "history in the making". We are, all of us news worthy and we are history in the making. David Barr is further proof of that. When returning from the war, Barr settled in as a Farmer, a profession and way of life he cherishes beyond any other. Having served as a wireless radio wave operator in WWII, Barr had completed a tour, flying 30 missions into peril, perhaps the thought of walking or driving an automobile was passe as eventually Barr built his own plane as seen in the photos below. (LtoR)Young David Barr during WWII, the Halifax Bomber (made in England)he used in WWII as a wireless radio wave operator & the plane he built. For youngsters to understand the importance of history, responsibility, and acquire an appreciation for life as we now know it, it's imperative to imagine standing where Grace Barr stood in front of the Granger School House and imagine school kids running passed hearing the school bell she had in her hand. That being said, it's difficult to imagine the entirety of a man's life. A farmer's life is 24-7. More difficult to imagine is finding the time to build a couple of lakes, farm, raise kids, and in your spare time, craft beautiful wood work with trees you grew yourself! Sound impossible? Completely true as seen below. What an irreplaceable opportunity of good fortune to be shown places of historical interest by Barr, who will be turning 92 this month. When history comes to life through a person's account over time, it's a gift to behold, cherish and most of all, to share. Over the next while, I'll post photos of a location introduced to me by Barr, share it with Shelburne Freelancer readers and ask if anyone can guess the location and it's significance. Special thanks to WWII Veteran David Barr for fighting for our country, and continuing throughout his life to live well,and his own words,"keep busy and earn his lunch." Surely the secret to longevity. 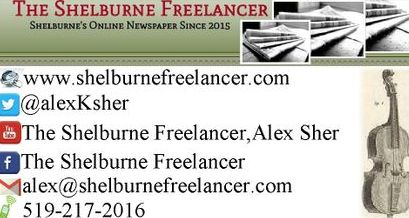 Keep checking in with Shelburne Freelancer. The next location is coming soon! and where it was located? Back in the day, this now long time residential building was affectionately known as the Granger School House and it is located on 1st Line ,East Mono on Lot 28. Beverly Parker for her correct answer. Sharing The World With Shelburne! The 164 Squadron Air Cadets Celebrated their 40th Anniversary in Shelburne in a captivating ceremony during their 40th Annual Inspection held on June 6th at Greenwood Park. In support of the 164 Squadron Air Cadets, Shelburne was treated to a great air show visit by a Newport and a Sopwith Camel. Adding an additional air of distinction, MPP Sylivia Jones, WWII Veterans and Legion Members were in attendance as well as 164 Squadron "royalty",family and friends of Shelburne's young distinguished Air Cadets of whom we are so proud! Go to June In Shelburne in the option bar for more coverage including video and more photos. (LtoR) Shawnette Crouse, Special Events Coordinator, Parks and Recreation Bookings, Grace Tipling Hall Coordinator, and Kristy Stevens, Accounting Clerk. Shelburne's (EDC) Economical Development Committee's Annual Golf Tournament on Thursday, June 4th took place at Shelburne Golf & Country Club. Players couldn't have asked for a more beautiful day for the chance to win $3500 of in store credit at Shelburne Home Hardware Building Centre for the coveted "Hole In One" or the barbecue, featured left, for the one who made it closest to the pin on the 18th hole. Sponsors of this year's event included, Shelburne Home Hardware Building Centre, Pace Credit Union, WAMCO, and S. Burnett & Associates Engineering. (LtoR) Shawnette Crouse, Special Events Coordinator, Parks and Recreation Bookings, Grace Tipling Hall Coordinator, and Kristy Stevens, Accounting Clerk made certain the event ran smoothly, explaining, "This is just a really fun day for Developers, Businessmen, and EDC members to come out and enjoy themselves and then everyone relaxes with a roast beef dinner to round out the day," commented Crouse. "It's also a great way to network as well." The winning team was John Telfer, Brent Eby,Tyler Eby, Tom Vanderkolk and winner of the closest to the pin on the 18th hole for the BBQ was Tyler Eby. Sadly there was not a winner of the hole in one for $3500 of in store credit at Shelburne Home Hardware! Now that would have been sweet to win! Good luck at next year's event! Go to more in the option bar and choose Sports for more video and photographic coverage. Find out what Food&Water First representatives had to say about Local Food Week and discover why they gave out 100 bags of potatoes from Downy Farms. Little Girl Tries To Save Injured BumbleBee at the Shelburne BIA Farmer's Market. See some highlights at the Shelburne BIA Market this week! Meet Shelburne's own, Billie-Jo Moore-Moore Hand of Hands On Catering. Local man, Barry Stacey charged with wearing medals that didn't belong to him offers Shelburne Veterans letter of apology. In Stacey's second court appearance, the Crown found Stacey had successfully completed all necessary criteria of the Direct Accountability Program in which Stacey made a Charitable Donation to a recognized charity, completed a written letter of apology and handed in medals to the authorities. Go to more in the option bar and choose Shelburne Legion News for their reaction and a catch-up on the back story. Hmm.. What do you think of reporters hounding you for a photograph? While standing beside this younster's father, The Shelburne Freelancer asked to take his picture. Safe to say, this little guy took matters into his own hands! To see video go to more in the option bar and choose Shelburne School News. Teachers perform in support of Hair Off For Headwaters! For more sports coverage including video, go to more in the option bar and choose Sports! Lots to see! The Shelburne Freelancer Monday, June 1, 2015. By Sick Kids Hospital For Raising $1400! 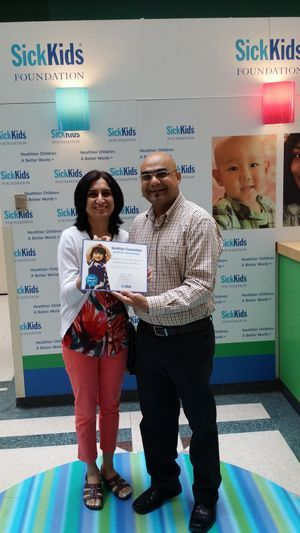 Shelburne Town Pharmacy owners, (L to R) Shalini and Sanjay Lekhi recieved a Certificate of Acknowledgement from Sick Kids Hospital in gratitude for their gala Fundraising Event held on Saturday, May 23rd. The Lekhi's were astounded to have surpassed their goal of raising $1000 bringing in $1400 in just a few hours with the help of the community and many volunteers. Lekhi now says, the Fund Raising event will be an annual affair. Congratulations to all involved for bringing the community together for such a great cause. For additional coverage go to 'more' the option bar and choose May 2015. Click on the advertisement if you are interested. WOW! Look What's Happened Today! Everything Asphalt is the name of the company who is responsible for the wonderful repair of the pothole found in the middle of the strip plaza located on Shelburne's Main St. much to the great appreciation of Shelburnites. Only weeks ago, owners of the Plaza, Doreen and Merlen Kropft were notified of the gravity of the situation posing serious safety issues and jumped into action and today was the day for the repair. Owner of Everything Asphalt, Mike Saunders commented," We surveyed the area and we don't anticipate any more problems. Maintaining is a big part of making sure cracks don't get too big and allow water to get in underneath the pavement causing problems." Everything Asphalt is located between Arthur and Mt. Forest and perform a wide variety of services from paving, sealing, line painting, repair, decorative concrete and lawn rolling. "We'll be back tonight to sweep up and install some paint lines," commented Saunders. Owners of the Plaza, Doreen and Merlen Kropft were very pleased to inform the Shelburne Freelancer of the job's completion and can now rest easy knowing their parking lot is safe. Hopefully fellow business owners and landlords in Shelburne will follow the example of taking pride in their community and maintaining a standard that reflects so. If you need more paving information, contact Everything Asphalt at 519-835-2913 and everythingasphalt@htomail.com.